The Upper Los Angeles River Area (ULARA) encompasses all the watershed and tributaries of the Los Angeles River and four groundwater basins, located above a point in the river designated by the Los Angeles County Department of Public Works (LACDPW) as Gaging Station F-57C-R, near the junction of the Los Angeles River and the Arroyo Seco. ULARA encompasses 328,500 acres, which includes 122,800 acres of valley fill areas (these represent the four groundwater basins), and 205,700 acres of tributary hills and mountains in the watershed. ULARA is bounded on the north and northwest by the Santa Susana Mountains; on the north and northeast by the San Gabriel Mountains; on the east by the San Rafael Hills; and on the south by the Santa Monica Mountains. Four distinct groundwater basins were defined by the ULARA Adjudication, as briefly described below. 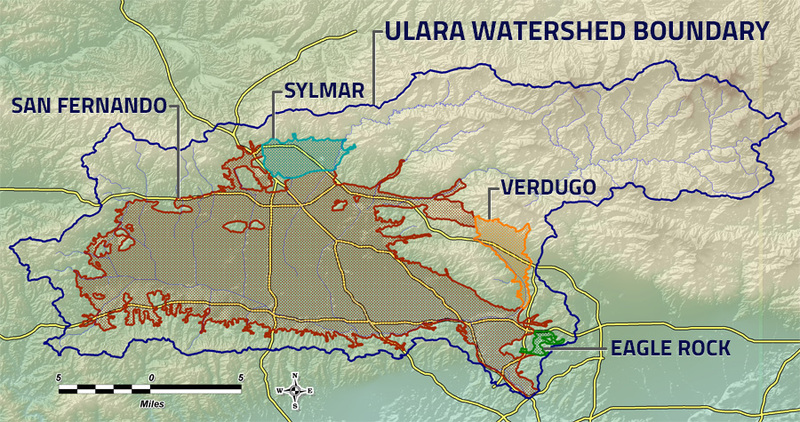 These four ULARA groundwater basins are the San Fernando, Sylmar, Verdugo, and Eagle Rock basins. The water supplies of these basins are separate and are replenished by deep percolation from rainfall, surface runoff and from a portion of the municipal-supply water that is delivered for use within these basins. Read more about the ULARA Groundwater Basins.